“This outstanding biography does more than just inform the reader of Ted Harrison’s life in a well organized way. A Brush Full of Colour is indicative of the spirit and passion of its subject and richly illuminates a national treasure! It does justice to Harrison’s artwork by including many reproductions from his early efforts to more recent drawings that are named, dated and commented upon as to the content of the drawing and its meaning. Many include a question posed to the reader. One of the highlights of this lovely book is a preface by Harrison where he refers to his art as ‘my simplistic artistic style’. He also includes a lovely tribute to meeting, over the years, students and lovers of art that have influenced him. Harrison urges readers to ‘keep on reading, writing and painting’. An index and bibliographical references are included. “…this book is virtually larger than life. Within a scant 40 pages, the authors share Ted Harrison’s progression from the coal-mining County Durham in England, to art school and military service post-WWII, teaching, immigration to Canada, and full-time artistry. “The table of contents for this lovely new book from Pajama Press entices with the promise of a foreword by the artist himself, and then goes on to let the reader know that soon they will learn about Ted’s childhood, his world travels, his life in the north, and his life as a full-time artist. I couldn’t wait to get started as I have been in awe of his work for many years. “…Here’s a book that will be as interesting for you as it will be for your child. 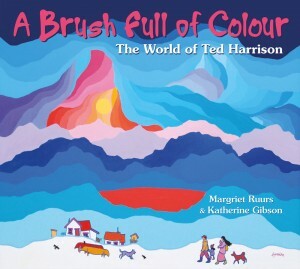 A Brush Full of Colour is a vibrant, fact-based picture book about Canadian artist Ted Harrison.